I was shopping at Wal-Mart this morning and as I drove into the parking lot my senses were overwhelmed with the scent of skunk. No doubt a skunk had sprayed nearby, and the whole parking lot and inside Wal-Mart had remnants of skunk smell. This got me to thinking - what an impact one little Soul can have - one little skunk, a huge building, tons of people, and everyone has noticed that smell. As we go about living our life, day to day, are we really aware of the scent we are leaving behind or the impact we have on others? 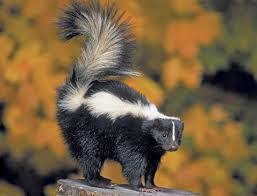 That 'impact' of the skunk is uniquely his - no other animal can leave quite as much of a message with a scent. 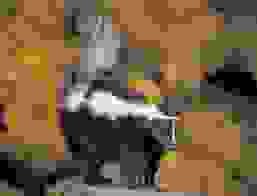 The skunk's unique ability to display his power and spray is what makes him unique. He doesn't have to be the biggest animal, the most majestic animal, or the fiercest. All he has to do is lift his little tail and his power will be known. What do you, as a human, have to do to let your power (balanced power of course) be known? What impact do you believe you have on the world, and the people in it? Have you found your purpose, your passion, your uniqueness? Have you stopped trying to be the biggest, most majestic, or fiercest and instead simply accepted your uniqueness of how you impact the world? Are you embracing your own gifts, power, and majestic birthright? Do you know what makes you uniquely 'you'? Do you embrace those parts of you, or lessen their significance in your attempt to be more like others? Do you even know what makes you unique? Time to find your inner skunk. Each and every human being has power...there is not one being that is created that is void of it. Why? Simply because true unique power comes from the combination of your Soul as the journeyer, with your unique Ego costume, both fuelled by the power of Essence/Source. How could you not have a unique power with all the possible combinations of how the best personality traits of Ego and Soul could work together and be fuelled by Source? Of course you have something to offer, something that is uniquely your own mark/scent on the world. What is your unique scent that you leave as your mark on the world? Feel free to post responses here or go to our free forum and post there. We need to get the public forum started at some point, so why not post what you believe your unique mark is, for the world, and we can get the conversation started. Slow huh? So maybe your inner turtle? Turtles do live long lives so they are doing something right.